The GW Bridge as seen with the buildings of Washington Heights. I was commissioned by a non profit organization called "Operation Exodus" to capture the feeling of living in the Heights. The GW Bridge is a big part of that and I felt it was important to get the essence of this neighborhood. 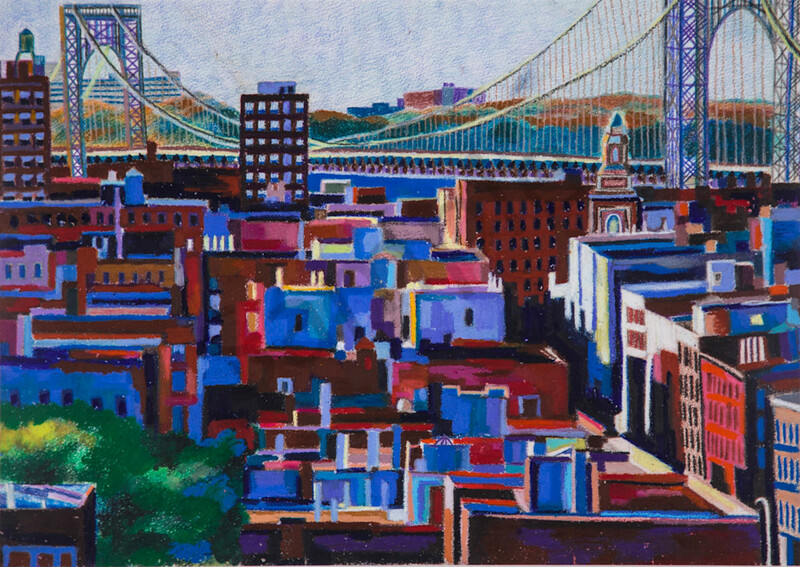 With colored pencils and oil pastels I used greens, browns, reds and blues to build my cityscape surrounding the bridge, and get the heart and vitality of this very special place in Northern Mahattan. Right near the bridge, where the church steeple is, the organizaion, "Operation Exodus" that tutors and mentors young childred and teenagers in Washington Heights, Manhattan, have their offices in the church basement..